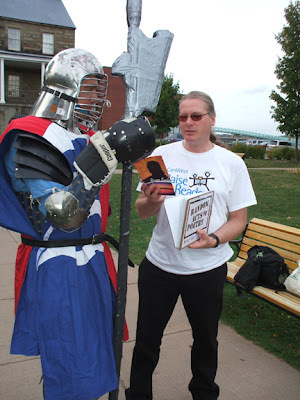 Ashes, Paper & Beans: Fredericton's Writing & Art Show with host Joe Blades. 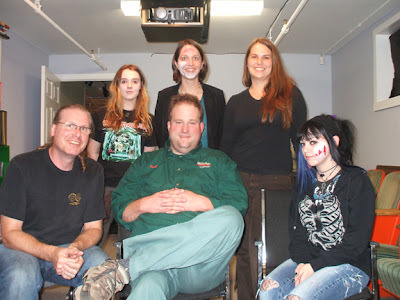 CHSR 97.9 FM, Fredericton, NB. Tonight's show started with "memoreeeee" by bill bissett. 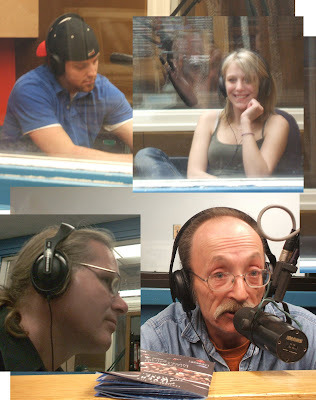 The feature was a lively interview-discussion with three for-the-most-part simultaneous guests: NB filmmaker Joel Thompson [top left], writer, director, producer of They Didn't Make It (Timeline Pictures); Whitney Illsley, actor; Jim Lavoie [bottom right], publicist for the Silver Wave Film Festival. Show ended with "The Night Is Executing Its Wishes" by Drek Daa and "Vive le (for Henri Chopin)" by Paul Dutton. 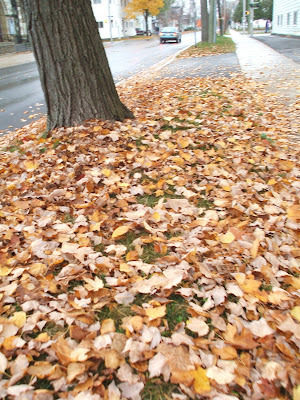 Autumn leaves, their colours, their brilliance in death, are a wonder. They cause wondering. New Brunswick has been especially colourful this autumn. Belong are several photos I took Saturday morning on George St, Fredericton, en route to the Farmer's Market before the filmmaking workshop. 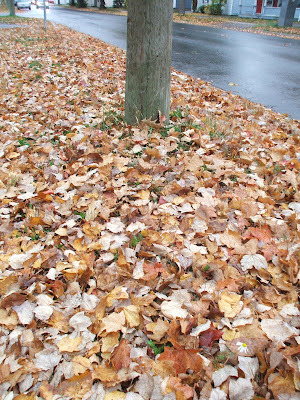 The splash of wet, yellow leaves under this tree caught my eye. 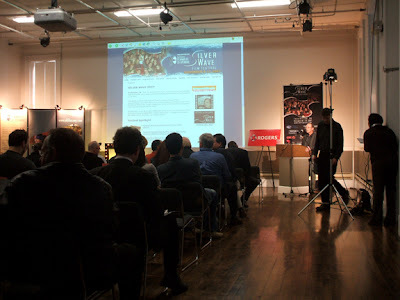 The 2nd half of the show started with my afternoon recording of the launch of the Nov 2007 Silver Wave Film Festival. 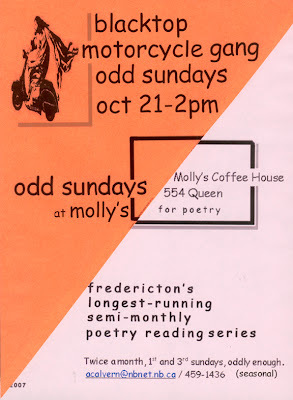 It was followed by Fredericton readings news; Drek Daa's "Pod of Granite Whales"; and bill bissett's "wuns I saw it raining frogs". Of late, Tuesdays have become my Fridays thanx to intensive filmmaking workshops on the normal weekends and the Art Bank day job on Mon-Tues. Means that I've been ending my work week with this radio show. 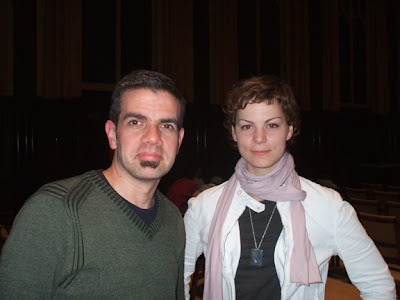 Tonight, I started it with a piece recorded during revue ellipse mag's 2007 Side by Side Festival of Literary Translation / Côte à Côte festival de traduction littéraire. "On Anne Szumigalski" discussion by Mark Abley & Elsabet Rafòls @ Side by Side Festival. "eating filet mignon" by bill bissett. "he sings" by Fortner Anderson + tape/head. David's Father by Robert Munsch. "Pod of Granite Whales" by Drek Daa. 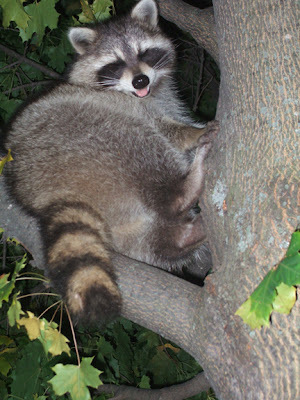 During the walk home, I treed a raccoon on Carleton Street. 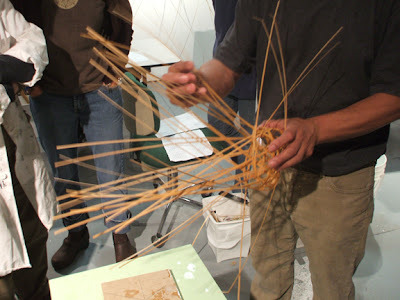 All day Friday I was one of a dozen peeps in Gallery Connexion learning something from Jiro Yonezawa about weaving with bamboo (aye, fellow SCAdians, bamboo does have uses other than for thumping people as swords and pole arms). Jiro in action, tightening in "weaver" strips and making sure all the right-angled weft strips were on the outside. Specifically, we made hexagon-random weave baskets. 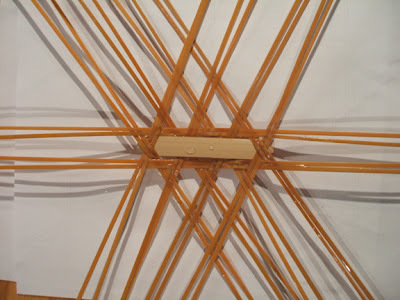 This is the base of my basket with three interlocking hexagons underneath the flat bamboo plate. 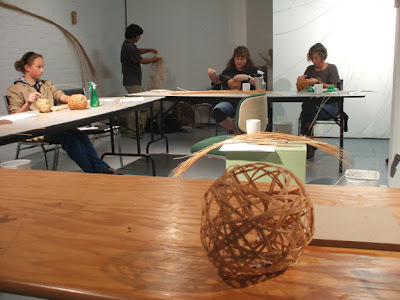 a view across Connexion with my finished basket in the foreground. Jiro with students and NBCCD peeps at the closing reception. Saturday and Sunday I was an workshop that picked up from the Sony Betacam stuff of a score of years back @ NSCAD and the Centre for Art Tapes with the newer 900 series of Sony HD cameras. First day was history and technical including more lighting and an ever-increasing understanding of just how much control the DOP and camera crew have over set lighting and the look of the final film-movie production. Jeff talking as he demos the camera's features. Extras needed: Džo, cast as tarbender, w/ a barfly John. Another barfly Jon . . . showing his claws. 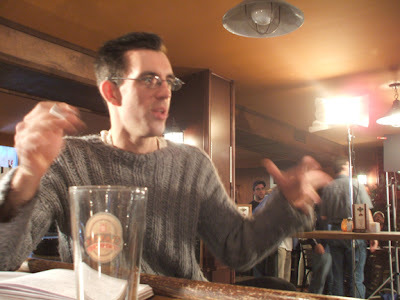 Instructor and cameraman/DOP, George Hosek, instructing the actors and crew on set of the workshop version of Diplomatic Relations, episode #4, "Back in Your Arms". After last week's double festival, two days of work, and a two-day workshop I was exhausted to the point of being sick through Thanksgiving. Thankfully, Tuesday was a short workweek and I started eating again that afternoon in prep for this week's workshop triartathon. Bruises, burns--first and second degree, scrapes, cuts, shock and peeling-skin zombies . . . all appeared before our learning hands. Suitable for stage, Halloween or low-budgie movies, and well on the way toward more advanced techniqies. 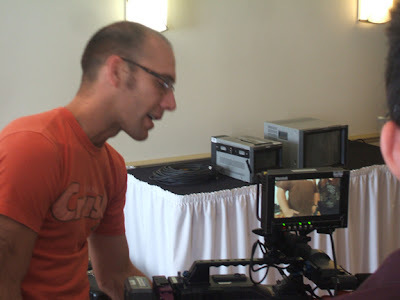 Tomorrow and Sunday, 13-14 Oct, I'll be in the New Brunswick Filmmakers’ Cooperative Certificate in Film and Television workshop: HD CAMERA @ the Crowne Plaza Fredericton Lord Beaverbrook hotel with instructors George Hosek and Jeff Wheaton. 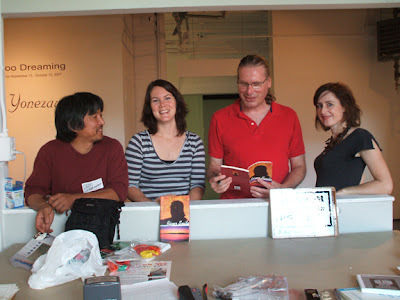 Throw in being on-call for art bank emergencies today, a two-author reading @ UNB, the weekend's Art Trek 2007 & its opening Frinight . . . and that's my artathon this week. The closest thing to an official reading for these troublesome writers . 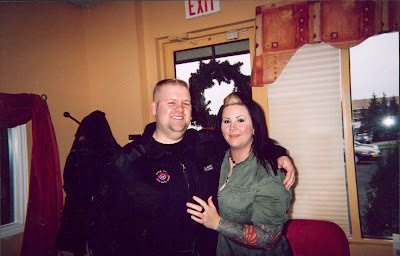 . .
BlackTop MotorCycle Gang rolls down Queen Street to Molly's @ 554 (opposite Officer's Square). Rumour has it new poems and new gang members will be presented . . . possibly a new Tread or two . . . 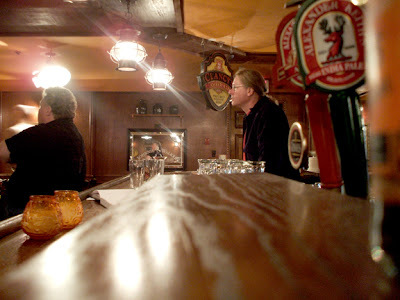 Rent your seat with beer, tea, coffee, or some of Molly's home style cooking . . . but be there and hear!!! 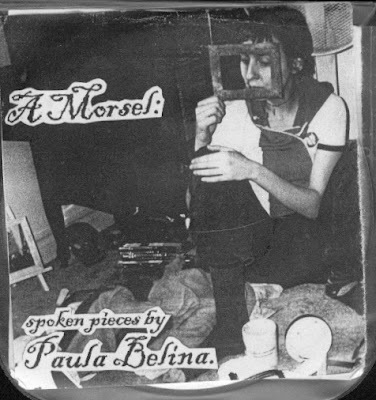 Tonight's show started with Montreal poet Paula Belina's mini-CD A Morsel: "turtle backs (p.e.i. )", "us two giants", "un morceau du milles-pattes", "the magicians", "dziag". "Go to the Sea" and " The Viking Ship" by PEI Poet Laureate Frank Ledwell. George Featherling reading poetry at Frye Jam 2007. 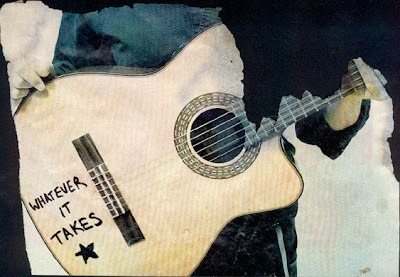 "Sometimes I think" by Fortner Anderson. Fredericton arts news. 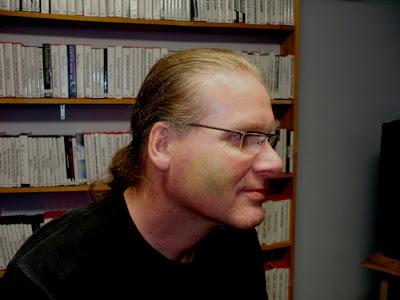 "The love song of roy g biv" and "play" by Kevin Matthews. 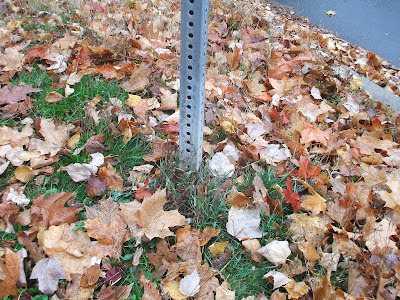 The deadline for submissions by New Brunswick visual artists to the 2007-2008 Acquisitions Program of the New Brunswick Art Bank has been extended to October 26, 2007. The Acquisitions Program purchases contemporary works of art by New Brunswick visual artists for display in government buildings. Every two years, a jury of artists and art professionals selects artwork to be purchased based on the acquisitions budget of $20,000. Artists who are Canadian citizens or landed immigrants who have resided in New Brunswick for 12 consecutive months prior to the application deadline are eligible to apply for the program. Artwork must have been produced during the past two years (between October 2005 and October 2007) and must be suitable for display in government buildings. La date limite pour la proposition d’œuvres d’art visuel dans le cadre du Programme des acquisitions de la Banque d’œuvres d’art du Nouveau-Brunswick 2007-2008 a été reportée au 26 octobre. Le Programme des acquisitions permet l’achat d’œuvres d’art contemporaines d’artistes de la province aux fins d’exposition dans les immeubles du gouvernement. Tous les deux ans, un jury composé d’artistes et de professionnels du domaine artistique procède à la sélection des œuvres à acheter. Sont admissibles les artistes visuels qui ont la citoyenneté canadienne ou qui sont des immigrants reçus et qui demeuraient au Nouveau-Brunswick depuis douze mois à la date limite de présentation des propositions. Les œuvres d’art doivent avoir été créées au cours des deux dernières années, c’est-à-dire entre octobre 2005 et octobre 2007, et bien se prêter à l’exposition dans les bâtiments du gouvernement. Found 4-ish on Friday, 5 Oct 2007 on the grass at a picnic table cluster between Sir Douglas Hazel Park and blockouse and the Small Craft Acquatic Centre on the Oromocto River alongside the bike & walking trail in Oromocto, NB. sound: Led Zeppelin "Black Mountain Rag"
A few pics from my camera from my week (so far) . . .
Have other pics to get from other people . 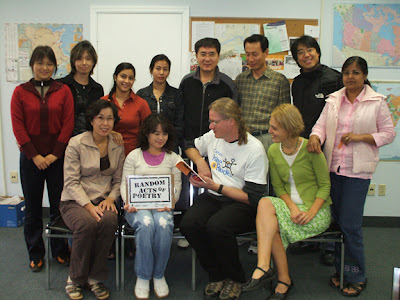 . .
@ the Multicultural Association of Fredericton with an ESL class of people recently new to the city from Korea, China, Bangladesh and India. Instructor is Cerrie McElroy. Reading to Lord Matteao Allesendro Ulisse Rusieri of the Shire of Lyndhaven. 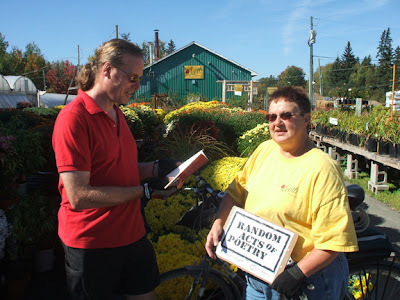 Reading to a woman working, watering plants, at Scott's Nursery in Lincoln, NB. 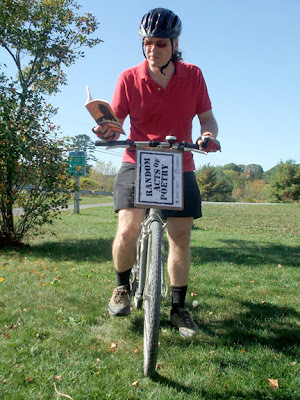 On my bike, with clipboard sign, en route to Oromocto. 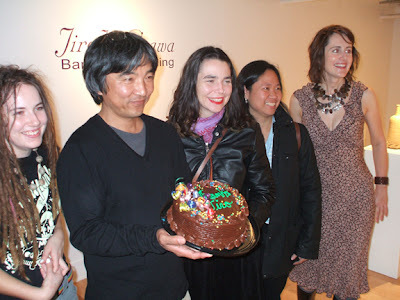 @ Gallery Connexion reading to Jiro Yonezawa (Japanese Master Bamboo Basketry Artist) Meredith Snider (Gallery Director) & Karet Ruet. 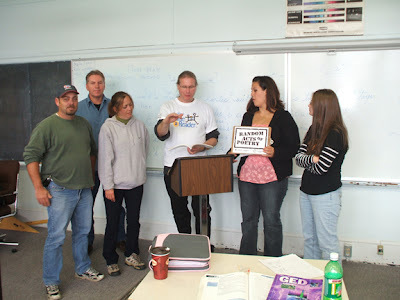 In a GED class at NBCC Fredericton Centre. 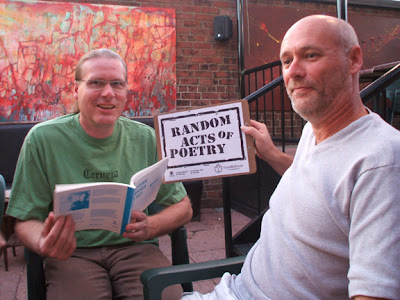 Random Acts of Poetry during Happy Hour @ Wilser's Room yesterday. Phil Lambert being poemed! (Also Andrea, WhiteFeather, Biff, John Born, Eric Hill, Mark, Mireille Eagan, Michael, Dana O'Regan . . . and, most unexpectedly, Sequoia, the husky-lab puppy I was filmed reading too by Kirk Pennell for the Trevor Doyle Live (Rogers TV) episode of 1 Oct.
Found in a passenger side door pocket of a rented Budget cargo van @ 9:06 AM, Thursday, 4 October 2007 while on Douglas Avenue Fredericton, NB, en route to Miramichi during a workday at the NB Art Bank Technician. Today's best "reading raid" . 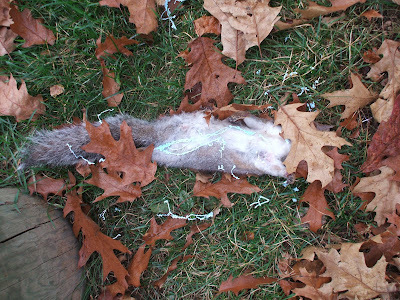 . . oooopps . 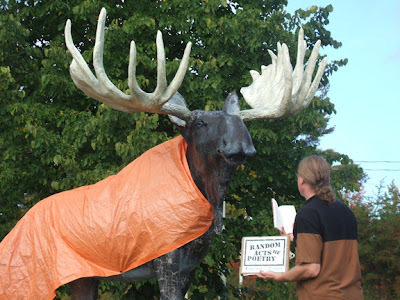 . . best Random Acts of Poetry: Joe Blades reading to Bruce the Moose (sculpture) in Doaktown, New Brunswick.